June 18, 2016 by John H.
This stool is so different from anything else I've seen. It sits well and looks great. 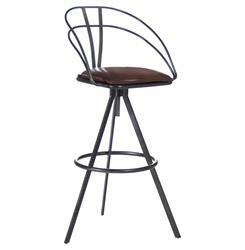 The comfort of this classic bar stool is surpassed only by its style. Elegant and modern, the polished black iron base, low back and footrest have sleek lines and understated shapes. Rich, dark leather covers the adjustable-height seat of this stool, ideal for your game room or kitchen.